The least exciting day of the trip so far. I left Iowa first thing in the morning, stopping only to mail about 17 postcards and a couple of unpaid bills. The Nebraska landscape is quite varied. For the first forty or so miles, it's rolling hills and farms similar to those seen in Iowa, if not as attractive as the "Field of Dreams" in eastern Iowa. Gradually the land use mix changes from crops to cattle, becoming almost totally cattle by the western part of the state. Didn't see a town with as many as 6,000 people the whole way across Nebraska; O'Neill, NE (pop. 4300 or so) claims the distinction of being the smallest town in the US to have a McDonald's without being located on an Interstate. US 20 is paralleled by a railroad the entire way across Nebraska, and well into Wyoming. My first real stop wasn't until I was about halfway across the state, when I doubled back to look at the Rock County Museum in Bassett. The county had taken an old church, an old school, and a couple of other buildings and relocated them at the site of the old train station. The locals contributed old photos and memorabilia to the museum, giving it an especially down-to-earth touch which was quite welcome. Both the church and the school, similarly, still contained many artifacts tied directly to their former roles. Shortly after leaving Bassett, I drove into a rainstorm that accompanied me all the way to Douglas. 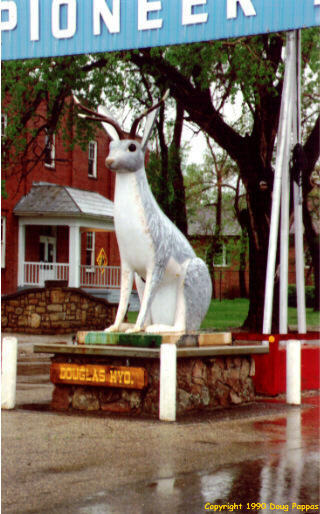 I had hoped to see the Museum of the Fur Trade in Chadron, but that doesn't open for the season until June -- missed it by three days! Pretty stupid to ignore Memorial Day as the semi-official start of summer, though. The next stop was Fort Robinson State Park west of Crawford -- an old Indian agency which was converted into a fort, then used until after World War II to train horses and dogs for the military. It's best known as the place where Sioux chief Crazy Horse was killed. Crazy Horse is honored by one of the two monuments out front, but the general tenor of the place is that those Indians deserved what they got for refusing to stay on their reservations. The fort has about 50 buildings, most of which are open to the public, but I concentrated on the main museum and wandered the grounds for a bit. Then it was into Wyoming. 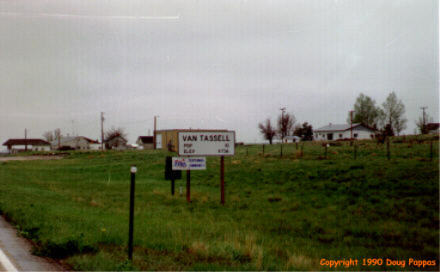 I knew for sure I was in the west when I reached Van Tassell, the first town: population 10, down from 99 in the 1930 census. Amazingly, the town is also home to American Legion Post #1, the first one organized in 1919 after World War I.
I stopped for a couple of historical markers on my way to Douglas, driving very carefully through the Lusk area. Two years ago I got a ticket just north of Lusk, written by an officer who had obviously staked out the area looking for speeders. The same thing was happening this time on US 20.